(From left to right) Student Spaceflights Experiments Program creators include Cade Lamont, Sydney Holler, Jason Liszka and Trey Saulsbery from Jamestown High School in Jamestown, Pa. Photo: LebanonTurf. As part of a new round of zero-gravity scientific tests, two of LebanonTurf’s soil care and fertilization products will be sent to the International Space Station: ROOTS Healthy Start 3-4-3 and ROOTS PHC BioPak. The space trip is part of Mission 4, an experiment designed to examine how a zero-gravity environment affects bacteria’s ability to decompose organic matter. Both of LebanonTurf’s products use microbes and bacteria to break down organic fertilizers in soil and fertilize roots. 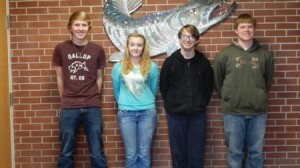 Ninth- and tenth-grade students at Jamestown High School in Jamestown, Pa., created the notion for the experiment under the direction of biology teacher Harry Rohrsbach. The students submitted their idea to the Student Spaceflights Experiments Program, a group that selects student-organized experiments for testing in low Earth orbit. Michael J. Kernan, Ph. D., turf scientist at LebanonTurf, is equally happy to be chosen. The launch is tentatively scheduled for Dec. 17 from the Mid-Atlantic Regional Spaceport at NASA’s Wallops Flight Facility on Wallops Island, Va.
For more information on Mission 4 to the International Space Station, visit the Student Spaceflight Experiments Program website.